Random things. From engineering to underwater photography and funny events. Basically... good stuff. It's been three years that Matt Refghi has been trying to get me to go to Dragon*Con in Atlanta, Georgia. Matt went to the two last ones and wrote up some nice posts about the top ten costumes at Dragon*Con 2011 and the top 5 costumes at Dragon*Con 2010. Well, I have the pleasure to announce that I will be going to be part of this crazy feast! After having had a small glimpse of what Dragon*Con might be by attending the Montreal Otakuthon 2012, there is no way I will miss out on this for another year! As the start date of Dragon*Con 2012 approaches (August 31st, 2012), the nights seem to get longer with all the enthusiasm building up! You can expect tons of pictures to come out of it! I will try to post pics at the end of every single day, and keep you informed on what costumes to look for! 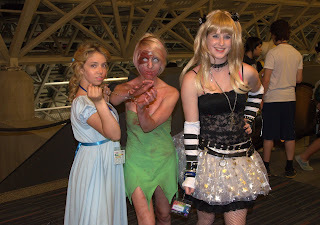 Take a look at the pictures taken during Otakuthon 2012. There were some pretty good costumes out there in this Con in Montreal. If you are planning to go to Dragon*Con 2012, let me know! If you are interested, I suggest you head over to the Dragon*Con 2012 registration page as soon as possibleas their "NEW limited number of Saturday Only passes" will only be available through the Dragon*Con store for 50$ until August 17th (tomorrow!). Good times, family, science, culture, linguistics, photography, travel, technology... A summary of my essence. Joseph Pereira. Powered by Blogger.